Our 25 day trip throughout the magnificent country of Uganda in August 2018 was one of the best in our lifetime. We come away with many cherished experiences and memories and plenty of awesome photographs and videos! 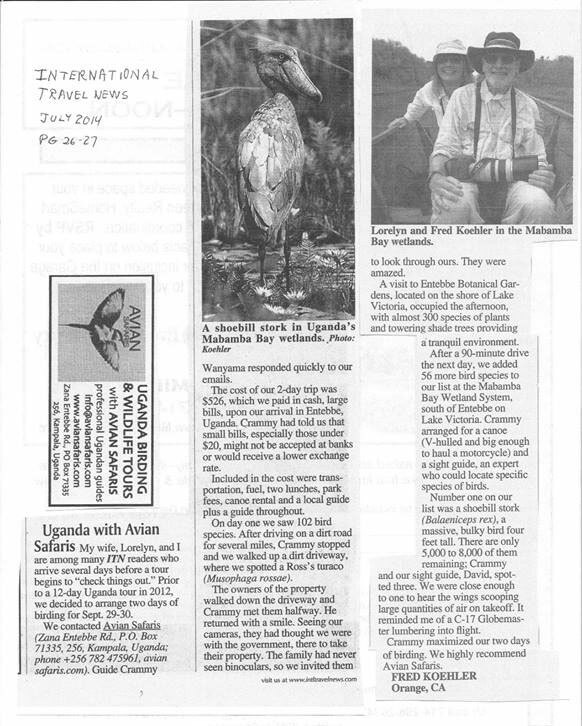 Very fortunate to have found Avian Safaris, a Ugandan tour company, to partner with and customize our trip. We are very selective and did research to verify the company was registered and well established. Crammy Wanyama, who happens to be the owner of the company, was our guide for the entire trip. We have travelled the world since 1996. Crammy is one of the best guides we have ever experienced! He and all his well-trained, local birding guides are dedicated to providing an expert, quality experience. The company website is designed with details to explain all they have to offer and give you detailed answers to assist you in planning your trip. Avian Safaris proved true to their word. When asking for specific information for our itinerary, replies to our inquiries were prompt and our special requests were always taken into consideration! There are many highlights we could share about our adventure in Uganda. We chose Uganda, after much research, to explore what is basically some of the best the African continent has to offer: the very welcoming Ugandan people, the culture, the history, good to great accommodations, safe travel, the delicious food, the varied landscapes/scenery, the wildlife and, yes, many birds! Our group saw nearly 600 species of birds and came away with over 350 lifers! And this was only our 2nd trip to Africa (we have travelled to South Africa). Each stop on our itinerary was great. Trekking for mountain gorillas, hiking to view chimpanzees and seeing wild white rhinoceros are experiences not to be missed if you have the time to do it. Birding for the Green-breasted Pitta can be a bit challenging but worth the reward when found. This trip exceeded our expectations and we extend our appreciation to Crammy and his Avian Safaris team! We’ve just finished our 3-week birding trip to Uganda and wow what a trip! Our journey took us from Entebbe on the shores of Lake Victoria west to the Mabamba Wetland and Lake Mburo NP and on to Bwindi Impenetrable NP for the Albertine Rift endemics, restricted species from the Congo forest. We then birded north to Queen Elizabeth NP, on to Kibale Forest NP and later to the Semliki Valley on the border with the Congo for the Guinea-Congo biome species. Then north-east to bird the Budongo Forest and on to Murchison Falls NP before completing the loop back to Entebbe. This route took us to the most abundant bird areas in Uganda covering a multitude of habitats from lush rainforest to wild savannahs, wetlands and swamps. We managed 521 species of which 289 were new for us having birdied seven other African countries but all of them (apart from Morocco) further south. Paddling through the channels of the Mabamba-Kamengo wetlands by canoe for Shoebill and finding this extraordinary iconic bird. Being in the Kibale Forest at dawn listening to the forest come alive and watching Chimpanzees wander by as we waited at a nest for Green-breasted Pitta. Waiting for dusk out on the savannah in Murchison Falls NP and then spotlighting for Nightjars and watching a lioness hunt Oribi. It was incredible to be out there in the wilderness watching all of the game prepare for nightfall. The game drives in Africa are incredible and none more so than here with the diversity of wildlife. The non-avian highlight was Mountain Gorilla tracking in Bwindi Impenetrable NP and then spending part of the morning just a few yards from these impressive primates and watching all of the interactions between the Silver-back male and family members as they went about their daily activities – a bucket list experience for sure and one we will never forget. We also went Chimpanzee tracking which was equally amazing. Our guide Crammy Wanyama was the best guide we have birded with anywhere in the world and having seriously birded 37 countries we know we are not easy to please! He is a superb guide and such a nice guy. Uganda is spectacular not just for its birds but its wildlife, and friendly people and a very high recommendation for any serious world birder. As always, Carol will add this trip to the itineraries on her website (www.canbirdtours.com) shortly. Meanwhile, if anyone would like details of our trip including route, guide and accommodations let me know, and I will happily pass it along. Lots of photos to follow! This 22 day Uganda birding and Nature trip were a customised for three. We covered a multitude of habitats Uganda the “Pearl of Africa” is gifted with. We birded inland freshwater shower lines & and rivers, woodlands, bushes and thickets, true Savanna, from Montane to mid elevation and down to lowland forests. Covering the African continent’s most important birdlife biomes – Albertine Rift Montane Forest, East Sudanian Savannah, Northern Acacia-Commiphora Bushlands and thickets, Northern Congolian Forest-Savanna Mosaic, Victoria Basin Forest-Savannah Mosaic, and Zambezian Flooded Grasslands, among others. We did well with local specialities; getting some of Africa’s most sought-after species- Shoebill, Grauer’s Broadbill, Green-breasted Pitta, Eastern Mountain Gorilla and Common Chimpanzee. Well favoured by weather, generally. Some evening showers were well appreciated for cooler mornings. The country was green which is usually the case during and after the rainy seasons, and probably best times for breeding resident species and both wildlife & scenic photography. A few parts like Lake Mburo and Ishasha the southern part of Queen Elizabeth National Park needed some rain, the latter happening to be the driest during the trip, most of the grass here was golden brown. “What amazing sight will we see today?” That was our mantra as we awoke every morning of our 22-day custom birding safari with Crammy Wanyama of Avian Safaris of Entebbe. We grew to expect something astounding, not because this was our first trip to Africa, but because Crammy put us in position to be surprised. The world of red dirt Africa whizzed by our comfortable A/C vehicle as we went from game park to game park, stopping at selected locations where dancing Gray-Crowned Cranes performed, or weaver nests galore decorated the acacia trees. We always got the best rooms at the best places, like when a herd of 25 elephants materialised right in front and below our cabin near Queen Elizabeth National Park, or where Ankola cattle with those enormous horns grazed and pesky baboons perched around and near our rock cabin (or banda). If I had to pick a peak experience that did not involve gorillas, it would be a night drive in the savannah of Murchinson Falls Park. Shining our lights out of the raised top of our vehicle over the herds of resting Oribi (a type of antelope), hoping to catch the eye shine of the Pennant nightjars, and seeing the streamer-winged birds take off in the light of our car and flutter into the night like giant moths. Although, visiting a Crowned Eagle nest after tracking the Green Breasted Pitta comes close. The numbers alone are incredible, 2200 km over 23 days, Crammy got me onto 200 species of birds to photographs, while over 500 were seen or heard by someone (that would be Crammy – a master birder) ) on our trip including 9 species of giant hornbills, 12 species of kingfishers, and 7 sightings of the Shoebill. We encountered 57 species of mammals, with 14 species of primates, including 21 gorillas and 16 chimps, tons and tons of hippos (not that many seen really, but probably in kgs! ), and a white rhino calf wallowing beside a tremendously horned, rhino mother. Thank you for sharing Uganda with us, Crammy! We plan on returning as soon as we can! Click Here To View Report 22 Days June 15 to July 6, 2017 Trip Report. 22 Days December 26, 2016, to January 16, 2017 Trip Report by William Young, Author of The Fascination of Birds: From the Albatross to the Yellowthroat. Thank You so much for this unforgettable tour! Crammy Wanyama is one of the best guides I’ve ever had. Right from the start, he customised an itinerary for us that allowed us to cover every single experience I wanted in Uganda, within three weeks and budget: Gorillas, chimps, Mountains of the Moon’s botanical giants (unfortunately we only saw the Giant Lobelia), Big 5, chameleons, good birding (especially Shoebill), night drives/walks for nocturnal animals, Batwa pygmies etc. Other agencies I asked merely threw me their standard itinerary and hoped that I would bite. On tour, Crammy was accommodating and flexible, polite and informative, and a bird guide extraordinaire with great ID skills (song & sight), even when it came to raptors and waders. He uses site guides (multiplying the number of spotters), which is true eco-tourism as it brings income to the local community. His 10-seater van was comfortable and had a pop-up roof that was great for safaris. It also ensured that the four of us in the tour each enjoyed a window seat. Crammy also went the extra mile. When I was ill, he arranged for the hotel to make me citrus juice twice daily, which he claimed works wonders for him. It perked me up too. He comes highly recommended by all four of us from Singapore. We enjoyed the tour! We saw a lot of animals (birds & mammals), and Ibrahim was a perfect guide. His know-how was helpful in finding the more difficult animals (lions, hyenas, etc.). His informative knowledge on the animals, the areas, etc. was excellent. Please send him our regards and compliments! The accommodation was excellent, and the services were superior. So again, we enjoyed the trip. I can’t believe how much we saw on our 14 days safari of Albertine endemic birds search. The unique bird species we observed, especially the endemics and restricted range species along with the unforgettable 24 gorillas in Bwindi, was incredible. I am happy to let you know, we appreciated your professional conduct, from the time of answering the mails to the last day with a very knowledgeable guide. Loved the mix of things especially the local experiences. Keep up the criteria for choosing your guides. You made our holiday very special. We stayed in Uganda from 27 December 2012 to 2 January 2013 and are now safely back home. We thoroughly enjoyed birding and gorilla tracking in your beautiful country. Our bird count reached 136 in total, of which many were new to us. We appreciate your hospitality and professionalism very much. You made our holiday very special. I just returned from my 17 Day Uganda Birding and Gorilla Tracking Tour. We ticked-off 420 species. Credits to Crammy our guide, he was very knowledgeable especially in our prime interest- the birds. You are very organised; we had everything attended to as planned. I strongly recommend. Thank you so much. We had a grand birding tour; it was everything we could have asked for. Everything went very smoothly. Yes, we saw the birds. We can work on getting some photos for you. If there are any websites that you would like me to post a positive review of your company, please let me know. Emma did an excellent job, and I will be happy to recommend you to anyone planning on making a Uganda or Rwanda. We are back home and working on time to sort our photos. I want to thank the staff of Avian Safaris for sincerely arranging and guiding my wife and me on our 17 days birds and wildlife photography trip in Uganda. Focusing on the region’s vast and exciting set of endemic species. Your flexibility and creativity fitting into my birding desires were extraordinary. I could not want more. I am impressed by the care of your organisation, the effectiveness of your birding site selection, and your enthusiasm and patience. I have never had more fun birding as with your guide. Thank you very much. We definitely will consider your company on our future trips to East African.